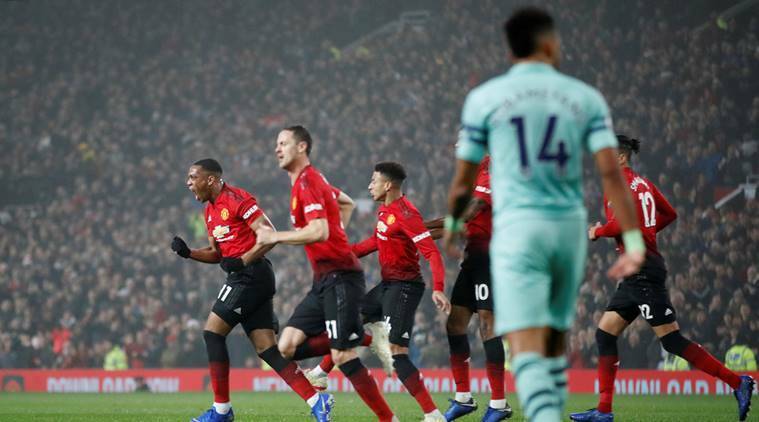 Although Manchester United’s winless Premier League run extended to four games with a 2-2 draw against Arsenal on Wednesday, there were at least signs of life at Old Trafford to appease their disgruntled fans. Some alarming stats ahead of United’s trip to Southampton on Saturday highlighted how laboured Jose Mourinho’s side have been this season, ranking 18th in the league in sprints made during games. But against Arsenal, although quality was still lacking, United at least showed intensity and actually made 24 more sprints than Unai Emery’s side. For the first 20 minutes, Arsenal struggled to find any form of rhythm with United pressing high. Then, as has happened in four of their last five league games, United conceded first to make their task all the more difficult. However, before the Old Trafford crowd could get too frustrated United had levelled through Anthony Martial, reinvigorating the hosts. “There is no space for players who don’t give it all,” Mourinho said in his programme notes, perhaps aimed at France midfielder Paul Pogba, who was on the bench for the second time in three matches. Mourinho’s players seemed to respond, immediately equalising again after Arsenal had scored a fortunate second, Jesse Lingard restoring parity 13 seconds after the restart following Alexandre Lacazette’s goal. That may be where the reasons for optimism end. Eighteen points behind leaders Manchester City, United are four points closer to bottom than top, and, after 15 league games, they have a negative goal difference. After 15 games in Louis van Gaal’s last season at United — a manager much derided for the negative football played during his tenure — United were six points better off, with a goal difference of plus 10. Even under David Moyes in 2013-14, a manager sacked after 10 months in charge, United had one less point at this stage, but at least had a positive goal difference. Mourinho insisted his side do not need a “miracle” to finish in the top four but, sitting eight points behind Arsenal in fourth, it will take some turnaround to ensure another season of Champions League football at Old Trafford.